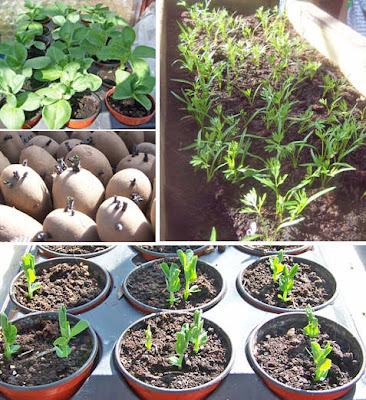 We germinate most of our seeds in seeds trays and transplant out into the plot as young plants. Most young seedlings need pricking out once they have germinated. This week has been a very mixed bag weather-wise, windy, rainy, sunny and cold. Sunday morning and we were back to waking to a keen frost. Despite all of this the countryside is taking on the fresh green look of early spring with hawthorns, which tend to dominate the hedgerows, breaking into leaf. A new addition to the verges is the daisies. Now is a good time to look out for bargains from nurseries and online plants-men. Many are selling off plants that remain after gardeners have completed their first main shop of the season. I have been on the look-out for some different varieties of hellebore and have just found the ideal collection at a bargain price which has been duly ordered. Many plants-men will send online newsletters to subscribers and many of these contain bargains that are not available to others. Sweet peas – Perfume delight and Kings Special Mixture, both reputedly have a good scent and long stems which I think is the main attraction of sweet peas. Tomatoes – Moneymaker, Roma VF, Gardeners’ Delight Brandywine and Shirley. Just four seeds have been sown of each variety. Strawberry – Alpine Mignonette, this is a second variety to add to the alpine strawberries already growing on the plot. Many items available from Harrod Horticultural are subject to reductions over the Easter period click here to browse. Tracy lives very close to the site which means she is readily available. She and her family spend a lot of time on site which means she is always aware of what is happening. She has a mixed plot growing vegetables on 2/3s of her plot and keeping poultry on 1/3 this means she is in tune with the needs of those who garden AND those who just tend livestock. She takes a pride in her plot and everything she does either when growing or looking after her hens is of the highest standard. As she tends her animals and often entertains on her plot in the evening she is in an ideal position to check on site security and has been often alert to unwelcome visitors. Tracy's plot is a good example of how a plot should be managed and maintained and during her first year of having a plot, she won the prize for the newcomer to allotment gardening. Her plot and behaviour on site conform to that which is set down in the council's tenancy agreement. 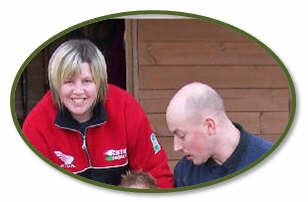 Tracy's children are regularly with her on site again giving her an insight into the needs of a young family. Tracy is young and enthusiastic - always being keen to learn how to do things better. The full and varied use that Tracy makes of her plot means she is in tune with the needs of all types of plot holders on Green Lane. In the interest of fairness if anyone wishes to say why they support a different volunteer please post a comment. Any comments that are of an abusive nature will be removed so please keep comments sensible. The council requests that any volunteers or nominations be sent to them by 3 April. If you have lost the form that was sent out by the council then email the allotments' officer. Either ask for a form or give your name or that of your nominee and the number of their plot (51 for Tracy) via email. We spent a long weekend in Glasshouses and probably chose the best weekend so far this year. We even managed to sit out in the garden of the cottage we rented. 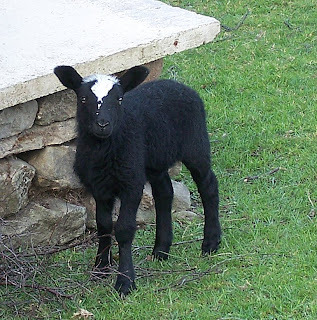 It was also just at the right time to enjoy watching the playful, newly born spring lambs that were in the field next door to the garden. They were as curious of us as we were them. They were not the only ones to be curious about us either! This has been a week for the first bit of some serious seed sowing in the garden greenhouse. Summer cabbage – Primo 2, broccoli – Olympia, cauliflower – Snowball have been sown in seed trays and peas - Kelvedon Wonder have been sown in small pots. The carrots sown earlier in the large trough are germinating well. No sign of the potatoes coming through yet though. The jostaberry cuttings have been potted on and are growing quickly. We will have to be careful not to let them grow too leggy this year as we could end up with even more cuttings. We just need to make sure they are taken out of the greenhouse soon. Any items for the agenda should be forwarded to Alastair by the 18th March. Raspberries the poor man's strawberry? Raspberries for some reason are often considered to be second best in comparison to strawberries. Maybe they can be a little more trouble to grow but the benefits of growing raspberries by far outweigh and effort needed to grow them. If you haven't done so already you need to set to and prune your raspberry canes. There are two 'families' of raspberries - early summer fruiting and late summer or autumn fruiting. Each requires a different method of pruning. Make sure you know which type of raspberries you have and prune them accordingly or you could end up with no fruit this year. To read more including how to prune click here. The March winds are certainly blowing! March is coming in like a lion so hopefully, (as the saying promises), will go out like a lamb! To me the start of March signals that the growing season will now begin in earnest. It’s the month to shake off the slippers and tug on the boots and make a more concerted effort to get onto the plot and into the garden. This week has been a mixed bag weatherwise. In the sunshine it has been quite a pleasure to be outside but at other times it has been bitterly cold with even a little sleet and hail. There have also been strong winds and just for a change some rain. The main jobs on the plot are still really tidying and constructing rather than any planting or sowing. The March diary (click here) has been begun and hopefully will soon describe more action on the plot and in the garden than has taken place so far this year. Well gardening action anyway!!! We managed a couple of visits to the plot. The bin containing the well rotted compost has now been emptied and spread on beds to enrich the soil. The autumn raspberries have been cut down and are sending up this year's fruiting canes. The buddleia bushes have also been pruned hard to encourage strong new growth. We have a row of these on the plot; this is as a result of having too great a success rate when taking cuttings. Anything that can’t find room in the garden ends up on the allotment. This not only makes the plot look less functional but encourages lots of wildlife; in the case of the buddleias lots of butterflies and bees. 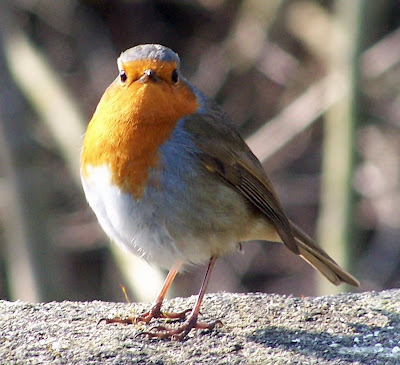 For us gardening isn't just about the plants it's also about who else we can share our plot with!